As the Taj Mahal is to Agra, so is the Charminar to Hyderabad. Ever since the construction of this astounding monument, every passing year has heaped so much importance to this structure that Charminar has become synonymous with the city of Hyderabad. It is the soul of the bustling city, the spirit of Hyderabad and its unique identity that is an amalgamation of tradition and modernity. The four minarets of the literally named Charminar has also been termed as the Arc de Triomphe of the East. And as it sits today in the important city that serves as the capital for two Indian states, Andhra Pradesh and Telangana, so it started as the centre of the capital city of Muhammad Quli Qutb Shah. The 5th Sultan of the Qutb Shahi dynasty, Muhammad Quli Qutb Shah, built the Charminar in 1591 CE when he shifted his capital from Golkonda to Hyderabad. The site of the monument is the intersection of the historical trade route connecting the markets of Golconda with the port city of Machilipatnam. 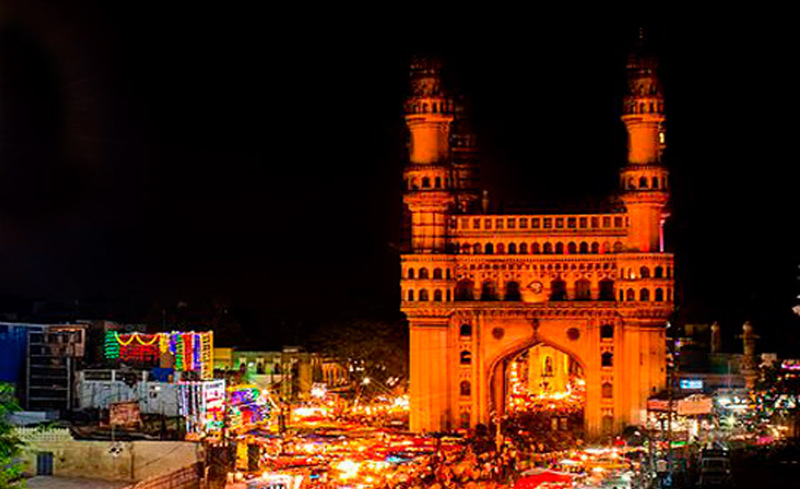 With the Charminar at the centre, the city of Hyderabad spreads around the four quadrants. Another romanticised legend of Charminar’s construction though untrue states that the monument was erected as a symbol of love at this place for it was here that the Sultan first saw his beloved, the very beautiful Bagmati. Mir Momin Astarabadi of the Qutb Shahi dynasty has a prominent role in planning the designs and layout of Charminar along with several architects from Persia who were invited to offer structural and design inputs. The design inspiration of Charminar is the Tazia or miniature mausoleums carried by the Shias in the month of Muharram. The Charminar is a square structure with each side measuring 20 metres, and constituting of four grand arches opening wide into streets at 11 metres. The four imposing minarets at each corner, hence the name, stand at 56 meteres in height. These minarets house two levels of balconies ending with small domes crowned by brass spires delicately placed and intricately designed with carvings on their external walls. The spiral staircase inside each minaret has 149 steps and 12 landings. While the four arches, ornamented by a row of small vaulted niches, face the four cardinal directions, the mosque on the top floor faces west in the direction of Mecca. This 400-year-old, four-storeyed structure took approximately a year to be completed and is constructed with marble, granite, limestone, and mortar. The dominant influence of Islamic architecture is visible in its arches and domes, the Persian influence evident in its minarets and the delicate stucco and floral ornamentations on the ceilings, balconies and the external walls display the Hindu influences, thereby making the Charminar a fine specimen of the Indo-Islamic architectural style. The beauty of Charminar lies in its perception, legends and also in its symbolic importance for the people. Various facets and factoids about the monument make it an intriguing structure. According to a legend, an underground tunnel connects the Charminar to the Golconda Fort but unsubstantiated claims are often rejected by historians and hence, this largely remains an adventurer’s tale. During the late 1600s, the south-western minaret was reportedly destroyed after being struck by lightning and was repaired at a cost of Rs. 60,000. Again, in 1824 the complete monument was re-plastered at a cost of Rs. 1,00,000. The Charminar mosque is one of the oldest surviving mosques of the city and is always filled with people offering prayers. Though in recent times, the entry to the top levels have been restricted. While some reasons cite the declining structural health of the monument and resulting safety hazards, a couple of suicide attempts from the balcony openings are also claimed as probable reasons. 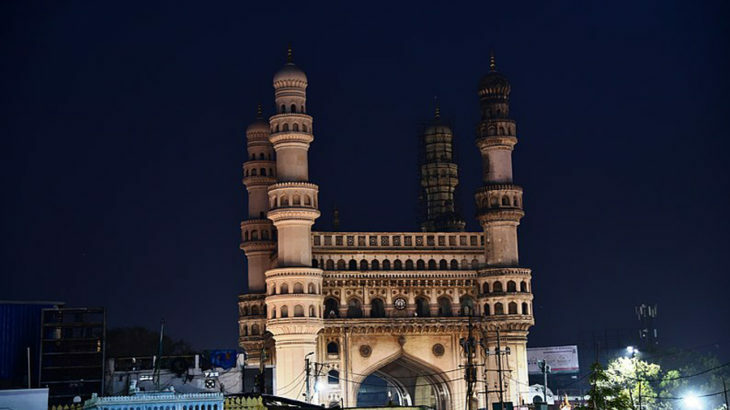 The famous night bazaar of Charminar during the month of Ramzan is a major draw for tourists and an experience that every traveller to Hyderabad should have. The market stays open until 2-3 am and helps the last minute shopping frenzy of Hyderabadis for Ramzan. The street food and local merchandise are priced quite temptingly. The iconic structure has come under the bane of progress and population. Various factors such as illegal encroachments by hawkers, street vendors, parking menace, and increasing vehicular traffic are adversely affecting the well-being of the monument. The good news is that the government is taking steps to address all such issues and promote the monument as an eco-friendly tourist destination, an example being the ongoing Charminar Pedestrianisation Project or CPP. The project has kick started several initiatives such as the exclusive hawker bridge near Salar Jung Museum aimed at relocation of hawkers, multi-level parking construction to ease the traffic-related congestions. Offering experiences, both special and mundane, the monument has become an unmistakable reflection of the city itself. The bustling bazaars and the sea of humanity around this old city landmark lends a unique colour and character to the Charminar—one that almost defines Hyderabad.